Our heavy-duty corner net bolts ensure the solid, long-lasting construction of the net wire surround in your bird control system. Use on corners and at any other point where the direction of your net changes to create a potential stress point and where you don’t want your anchor to bend or break. 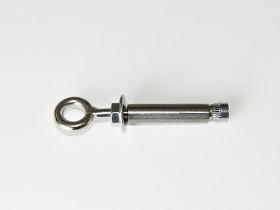 Made from hardwearing stainless steel with a closed eye at one end, we sell M6 corner net bolts in packs of 10.